RAS is an application in the system operator’s advanced energy management suite of applications that is used to provide improved management of contingencies and the modelling of the effects of Special Protection Schemes (SPS). This enables us to provide a more accurate set of remedial actions to improve Grid security. An SPS is an automatic protection scheme installed in at a substation, the purpose of which is to take action (post event) to switch assets out of service or to reduce load or run back generation, to correct or prevent an overload. Before the introduction of RAS, the system operator’s Simultaneous Feasibility Test automatic constraint builder application (SFT) used contingency definitions as the basis for its constraint formulation. The inability of the SFT contingency modelling tool to model SPS’s accurately meant constraints generated by SFT required some manual intervention to enhance accuracy. In some cases SFT was unable to model SPSs at all. RAS modelling will now allow SPS schemes to be modelled more accurately without manual intervention thereby increasing the accuracy of SFT constraints or the need for a constraint. For all qualified contingency cases (RAS enabled), first all RASs are tested. If a stage of any RAS is fired, then the base contingency plus the added RAS components is solved. The post contingent state is tested against all RASs. This iterative process continues till either no more RAS stages are fired and the violation has cleared, or a user-defined number of RAS iterations have transpired. 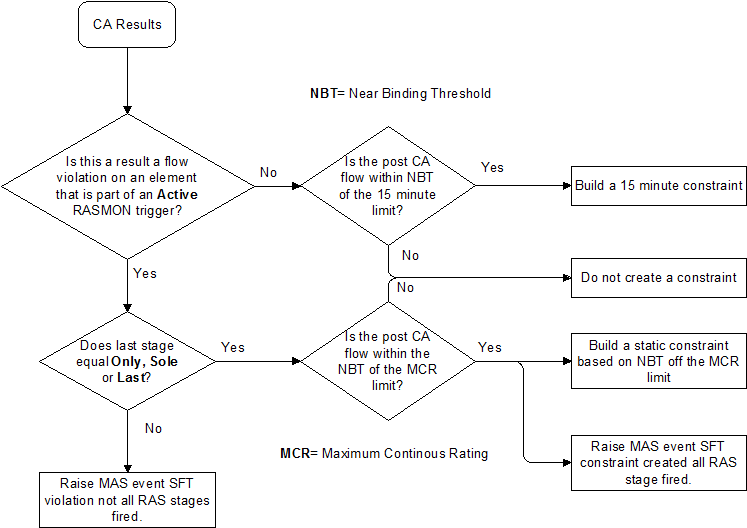 If the last or only RAS has fired and violations still exist on the monitored branch then SFT will create a constraint if the post CA flow is within the NBT of the MCR. If the last or only RAS has fired and violations still exist on any other Branch rather than the monitored branch then SFT will create a constraint if the post CA flow is within the NBT of the 15 minute limit. The system operator also requires a tool set that enables it to effectively support a broader range of SPS proposals, including to model schemes not able to be modelled by SFT. This is especially important with the growing number of SPS’s under active consideration or actual development. Together, this enables the us to operate the transmission system with improved accuracy, thereby improving security.